Sometime in 2007, post the publication of UNSUNG, Mr.Arun Maira (then chairman of Boston Consulting in India) had nominated me for consideration of an International fellowship. Selected Fellows would be taken to the US, all expenses paid and the organisation would arrange meetings with whoever the Fellows wanted to meet (other than the senior most members of the US administration). The aim was to encourage the emerging social leaders and help them build networks. During the selection interview, I told the members of the committee that if selected, I wanted to study the rising conflict amongst us – conflict for land, water, language, religion. Conflict between nature and human beings…. They were a bit perplexed that I did not want to meet photographers and people from related fields. I was not even short listed but the I did not stop thinking about the ‘conflicts’. Today it has reached a crescendo..
“I wanted this interview because I don’t want to die. I hope you’ll help me to live” said Menake, the captured female suicide bomber of LTTE. I was sitting in front of her in the safe house of the Anti Terror Police of Srilanka in Colombo. It was 2007. It had taken writer Jan Goodwin and I, 6 months to set up this interview. At that time Sri Lanka was considered to be the second most dangerous place in the world after Afghanistan. Colombo was highly militarised. I was not allowed out on the street with cameras without an intelligence operative walking next to me. The fear of suicide bombing lingered everywhere. Menake was raped by her father when she was a child. A series of accidents caused her even more trauma through her childhood. The Tsunami killed her mother. Her caretaker aunt gave her away to LTTE’s black tiger unit. (The suicide bombers were called Black tigers). LTTE promised to take care of her brother after she blew herself. They trained her thoroughly. She was to assassinate the then Prime Minister of Sri Lanka. Life had served Menake with severe blows right from her childhood and there wasn’t much left to live for. She was disenfranchised and disillusioned. But when she reached Colombo with her handler to go through with the assassination assignment, things changed. She saw life in the beautiful city of Colombo, hope sprang, she wanted to live and she fumbled during the recce. She was caught by the authorities. I think of Menake every time there is a terror attack in the world, when young soldiers die, when innocent people die, when habitats disappear, when nature disappears and I wonder why have we created such a fragmented and conflict ridden world? How is that we missed the plot so badly? Most of the terrorist/separatist organisations started of to claim their physical place on earth – their land, their identity. Over the decades these groups have become something completely different, unfathomable actually. Many internal agendas, that of governments & their agencies, individuals of those agencies, terror lords, arms manufactures…etc have interwined and layered upon each other. Conflict zones are dark environments, one cannot trust anyone. Today the entire world seems to be a conflict zone. Add to this is the societal polarisation caused by the economy, the result is that an exponential number of people are getting disenfranchised and disillusioned. Some of the disenfranchised are easily getting drafted into the terror groups and changing the profile of the terror operative. Many years ago, Digvijay Singh (yes, believe it or not) and Nitish Kumar were the only politicians who said that “Naxalism/Maoism’ was a developmental issue and not a law or order issue. Perhaps in the most fundamental level this holds true for terrorism as well. I don’t think that bombing the hell out of Middle East and or fighting terror with escalating force is a permanent solution to the issue. The solution can only come about by reducing the ever increasing wealth gap between people. If the trend continues by the end of 2016, 1% of earth’s population holds 99% of the wealth says a report by Oxfam. The solution to mitigate the global conflicts is only possible by providing good education, health care, sanitation and infrastructure at minimal cost to the global south, it can come about by caring and preserving nature and natural resources, bringing about a serious change in the agricultural sector (In India at least) and changing our definition of success! The status quo must be changed. It is easier said than done. Perhaps it is easier for leaders of nations to sanction military option and buy arms than to provide the nation what is really necessary. In the repeated conflicts Manake endures with faith, with trust, with betrayal of those, with nature, with power, with freedom and not to mention her own personal and emotional conflicts as she made the choices she did – she did not kill, she did not take lives.. she decided to give life a chance. I do not know if she has been rehabilitated as the authorities told us, I hope she has been. But the bigger question is can we rehabilitate ourselves? My blog has now moved to http://www.maheshbhat.com/blog – I am looking forward to interacting with you there! Italian photographer Fausto Giaccone’s works from his beautiful photo book ‘Macondo’ is the centre point of the Sensorium art festival being held at Sunapranta Goa Centre for Arts from December 6. In his book, Fausto has magically revealed Gabriel García Márquez’ literary world by way of photographs I had interviewed him for Navhind Times. Fausto used a Rollie, a ‘Twin Lens Reflex’ analogue camera for this project. Wrierc Chiaramonte in his essay ‘Memory of Macondo’ writes about Fausto shooting while holding the camera close to his heart. “It is a very nice interpenetration by Giovanni; however, it is a metaphor. I started photography in the 60s and at that time the camera was Nikon F. All my life I have used Nikon, a 35mm camera. The choice of Rollei for Macondo happened because I was trying to find a new photographic language – not that of a photojournalist, because all my life I have been a photo journalist. “Photojournalists used 35mm cameras and I thought of trying to find a different approach, a different distance. I didn’t want to carry heavy cameras and lenses either. Rollei was perfect in all aspects. I was not interested in wide angles or tele photo lenses. “Also, when I read ‘One Hundred Years of Solitude’ the first time I was very young. I remember that I could not place the story in a real world. I was in South America and at that time had not been out of Europe. I was not able to put it in context. “I don’t know if it will work for everyone, but for me, I need to feel first. It is a kind of instinct. I feel when things are all right for me. Then I understand better what is happening around me. Sometimes I change; I adjust my way of working. But feeling is most important. I had worked in Colombia many times, always on precise assignments. But, for Macondo I wanted to be totally free. “It was not an assignment, it was just a desire. After almost forty years of work I wanted to do something more important than my professional work; something that spoke about me. Though the work was inspired by Gabo’s writing, this was kind of an outer portrait of mine, which perhaps all personal works of photographers are. I read his auto biography and biography by Gerard Martin. In the beginning I started to capture the places that reminded me of the ‘100 Years of Solitude’. As I went on everything I saw reminded me of ‘100 years…’ and now all the pictures from the book remind me of the novel. I work slowly. I build stories year after year. I have had just four books in forty years. I like to build and rebuild things; it is important to me. I like to stay for long and find a personal vision. It is very important to find a personal vision. I become friends with the people I photograph, I keep in touch, and I photograph them over time. They become a symbol of the passage of time. For me the most important work is when life – my personal life – and photography fit together. I like to work in places where it seems there is nothing to see. But I ask, dig deeper and see pictures where apparently there is nothing to be seen. The most difficult thing is to find things when there is nothing. Macondo is not only work; it is my life. Because it is a culture I like, I feel very close to. Like all my peers, I started shooting on film. 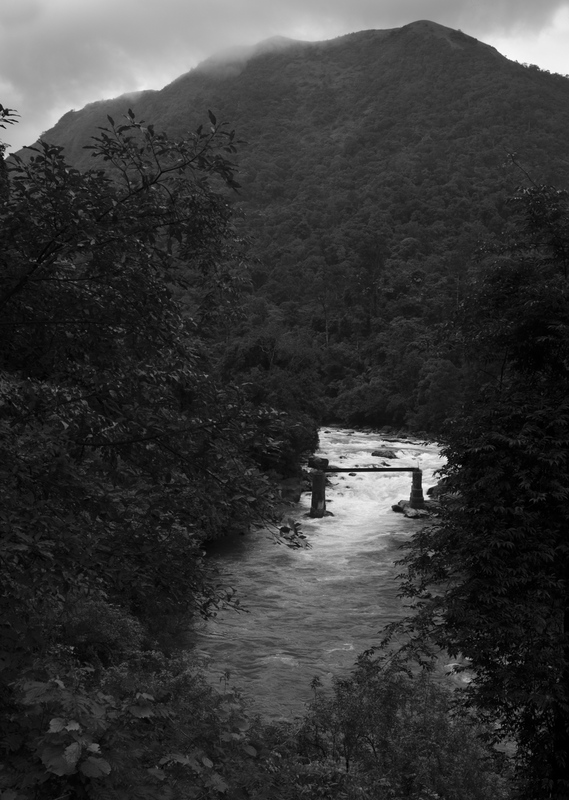 In mid 80s in India, B&W was much cheaper than colour and I could process it myself. It was easier to print than colour. Ilford FP-4 was widely available at Rs.20/- per roll if one bought a pack of 10s. Microdol-X was my preferred developer, diluted 1:3. So I shot a lot of B&W and later colour after turning a professional. I have now begun to catalogue my work of three decades. As I look back three decades and, the “Allure of Film’ pulled me in. The images shot on film, negatives especially look beautiful, poetic. There is an enveloping softness, something intangible in those images that tug your heart. Shooting with film teaches you the craft of photography, to visualize and patience. The images recorded on the modern digital sensor are sharper than a Hattori Hanzo sword. 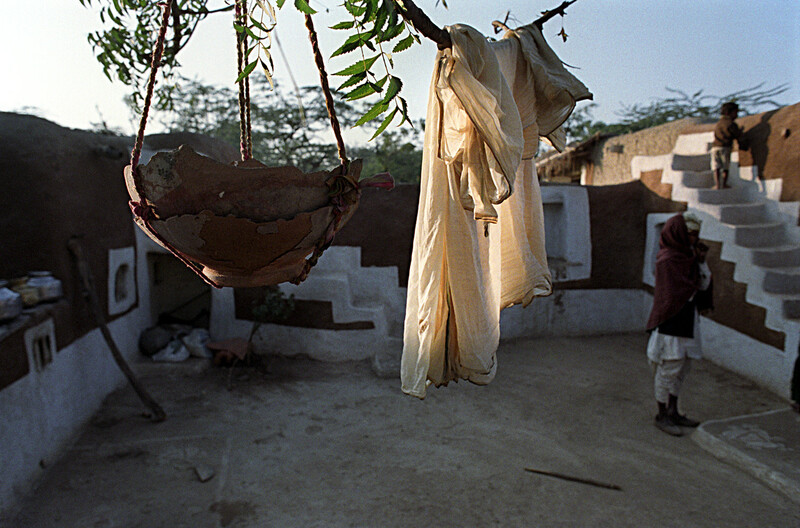 However many of them seem to lack the craft that is required to make an image using film. The revival of film is already underway, with the success of Impossible Project and the efforts to revive other brands of film. Ferrania tried to raise USD250000.00 via their Kickstarter campaign and they already have USD281000.00 with eleven days to go! 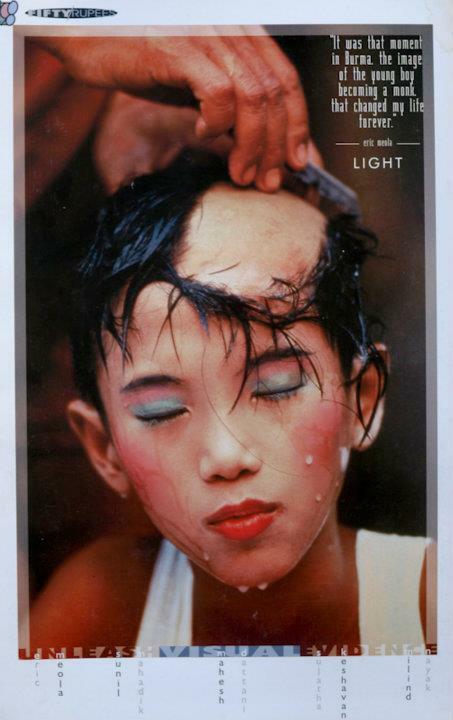 The great photographer Eric Meola made a stunning image in Burma that changed his life. It was of a ceremony known as Shinbyu”–where young boys would become Buddh and would be initiated as novice monks. I was driving towards Bangalore from Mangalore in the middle of August. It was the independence day weekend. As I went up the winding roads of the Western Ghats, river Netravati was flowing down towards Mangalore on my right hand side. She has been in my conscience, right from my childhood days. During monsoons, there were floods and schools used to be closed for a day or two. We waited for those moments eagerly, without realising the life on the flood plains during such times. Some of my class mates lived there. I have lived in Bangalore since 1987 and in rural Bangalore for the last 14 years. As rural Bangalore has become increasingly urban, the water table has sunk down to a good 700 + feet below the ground level. Most of the ponds and lakes are dry, land is parched and people have been clamouring for water. So some people in the state government of Karnataka worked out a scheme to pump up the ‘excess’ water to Bangalore rural district. They claimed it was getting ‘wasted’ during the monsoons and going into the sea. This idea has caught the imagination of the people of rural Bangalore district and they are looking forward to the water of Netravati to fill their tanks and lakes. However the people of Mangalore are up in arms. This so called ‘waste’ water is important to maintain the balance of salinity in the delta. Apart form it, this project if implemented will destroy many acres of pristine rain forest. Energy required to pump this water to Bangalore which is about 180Km away and at a higher level too is enormous. So, how does one provide water to rural Bangalore without upsetting the ecosystem? 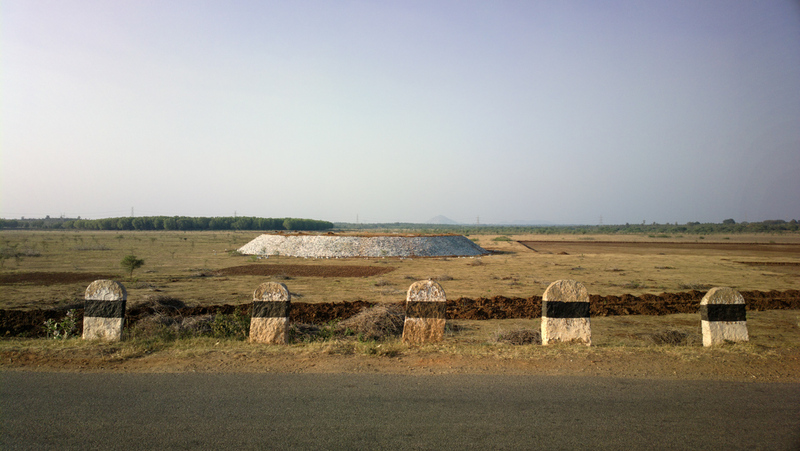 Dry lake bed of Madhure Lake, in Rural Bangalore District. This 198 hectare lake has been dry for years. State Govt. Spent about Rs.3 crores (US$500000) to rejuvenate it, which according to me is a wasted effort. When the beautiful Ira presented herself before me, I couldn’t help but photographing. The setting was beautiful too at Bairro das Fontainhas, Panaji, Goa.